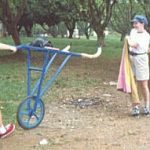 In October 1998 a group of six indoor kite flyers from various parts of the world were brought together in Colombia, South America by Eco Sports of Colombia . Eco Sports is a young entertainment, promotion and production company. They promote sporting, artistic and cultural events, especially lesser known sports. They have also brought gymnastics, the marathon, boxing and other Olympic sports to Colombia. Our mission was to demonstrate indoor kite flying to the public in Colombia’s three largest cities. The indoor fliers were: Heather Morrow (Tango Girl) from New Mexico; Mike Delfar (Spielberg & Mr. Big) from Wisconsin; Paul DeBakker (Paul Decaprio) from Holland; Fernando Martinez (Nando) from Spain; Alehondro (Oches) from Medellin, Colombia and myself, Penny Lingenfelter (Kite Fairy). We had a fantastic time and learned a lot about Colombia, kiteflying and about each other. Eco Sports requested that we be ambassadors for Colombia and share how we felt about our experiences in their land. Our experiences were so different, so real. The memories make me smile and cry in the same moment. Thank you Eco Sports for all the hard work that you put into “Aire Party 98”. We will never forget it! The Colombian people were very friendly, patient with our attempts to communicate, helpful, and humorous. From the moment I entered the boarding area in Miami till my return, the Colombian people were generous with advice. “Do not walk the streets alone at night.” “Do not stray from your group.” It was common sense advice especially since I knew no Spanish! When I debarked in Bogota, the people helped me to get through the quickest lines in customs. “Follow us,” “Don’t get lost,” spoken in English from those that would take the same small plane to Medellin. The Airline personnel, speaking on their walkie-talkies, “An Americana, she mustn’t be lost”. They were very helpful, but the public had already taken me under their wings. That’s the beginning of a trip that continued to be so very heartwarming. Our Eco Sports entourage in Medellin consisted of Camilo Lopez. Event Coordinator; Julio Gomez and Margarita Olarte, owners; Charlie Mejia, Production Chief and Santiago Fernandez as our translator. People were always friendly and kind to us. Sometimes almost too much so. We would be mobbed by children who wanted the presents that we had brought, or just our autographs. We would find ourselves ushered into a room for our own safety, where we would inform our protectors we liked giving autographs and felt fine in the crowd. Then they would let us back out to do as we pleased. What a boost for our egos!! I had the most fun trying to communicate with the children. Not till near the end of my trip did I realize why they laughed so hard at me. I was asking them all if they were boys, not what their names were! I vow to learn some Spanish on the chance of a return trip and also because it would be such a useful language to know. The police were evident everywhere we went, but crime was not. The young police showed small smiles and were just as impressed with the kites as the public was. We did need them on a few occasions to keep the crowds from unknowingly trampling our gear in their efforts to get our autographs. “Please, in English,” they would say. Ha! How would I write my name in Spanish? O.K., I had a few misconceptions. You know. They have no TV. Third World country… high crime, etc. I didn’t wear my wedding ring. I have completely different ideas now! The women are very proud to be Colombian women. They dress so sharp! Lots of beautiful clothes, shoes, and jewelry. (I had to buy a pair of shoes; they’re so cute) The men were always gentlemen, yet we witnessed no chauvinism. I’m trying and I can’t think of anything bad to say about the Colombian people. We were treated so well, it was sad to leave the friends we had made. We were living a kiteflyer’s dream. An all expense paid trip to Colombia, plus pay to show indoor & outdoor kiteflying. I had worked with instructor Stephanie Clarke from “Just for Kicks” School of Dance to choreograph & create a complete indoor kiteflying routine. She added as much to my self-confidence as she did to my kiteflying. We showed Heather on Synergys. Mike started with a Benson “Innerspace” as well as a “Cube” and before long, he switched to a Skyburner NikNak. Paul flew an Avia “Synchro” and with Nando energizing a Skyburner NikNak and a Quadrifoil C3. Ochas flew Revolutions in singles, stacks, and with sparklers! He also flew fighters. He is quite the crowd pleaser! I flew my Revolutions and wore costumes. The crowds were large and extremely appreciative. We flew in stadiums, coliseums, town squares, three story malls, schools, and large gymnasiums — almost everywhere! There were TV cameras and newspaper reporters at most places. “Olla, Momma!” I say. Eco Sports was the best! They have a staff that we could depend on to complete all details. It was their first endeavor at indoor fly shows and a learning experience for all of us. Quite often there was wind indoors, and no wind outdoors, the opposite of what we wanted. We all kept a sense of humor about it and faced the challenges that we met. (Remember, kiteflyers shouldn’t take themselves too seriously.) We would do one to three shows a day depending on our sponsors. Indoor kiteflying is for kids of all ages. It is great exercise and with three shows a day we had no trouble sleeping at night! It really was a dream come true to take indoor kiteflying to the children, as well as the adults. 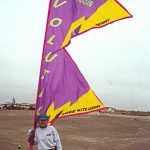 The spirit of kiteflying cannot be captured in a picture, or even a video. We know you’re not truly hooked until you feel the tug of the strings in your heart! 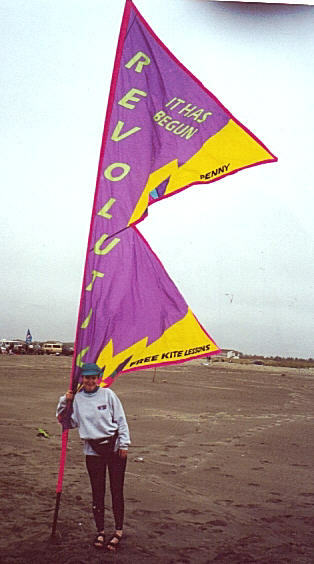 If you’re not a kiteflyer you can’t imagine the energy we felt! And you really are missing something. Heather Morrow asked for a traditional Colombian meal on her first night there. I bet she won’t ask for that again! It consisted of rice, beef, chicken or fish, fried platano (bananas), and sliced tomatoes with shredded onion and cabbage. It is an excellent meal that is very healthy. However, since our sponsors owned the restaurants, and the cost had to be kept down, it was served twice a day for two weeks. See, they sponsored different sporting events and we could wander in anytime to be fed. There were no menus and you got what was handed out. It was delicious at first but then, after about ten days of it, we started protesting. I longed for ensalada (salad). Others drooled over the thought of presto (hamburger, fast food). We ventured off once in awhile to satisfy the needed change in our diet. Actually, Colombia is well known for some of its cuisine. There were delicious fruit deserts, deep fried pastries, tamales, and much more. We did find some of these. 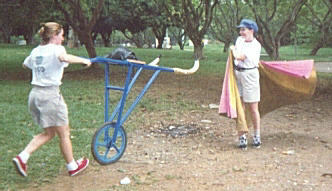 We were taken on entertaining, and educational tours of Colombia. The Mayor of Valpariso (Paradise Valley) took us on a tour of a coffee, banana, and sugarcane plantation. We saw the process from beginning to end. They showed us what they do with coffee beans, and sugarcane, plus all their byproducts. This included “Augudente”, the Colombian version of every country’s own liquor. It was very good. But after a few shots, you could find yourself in pain the next day! We discovered how much sweeter and juicier fresh sugar cane is right off the stalk. They also have an afternoon drink that is customary at lunch time. It is considered Colombian Gatorade. It is very good. While drinking it I wondered if it was apple juice with lemon, or weak tea with lemon. Neither! It was sugarcane water with lemon. Quite an energy drink, and quite tasty! Jokes of “no need for Viagra here,” were clearly understood in all languages. We stayed in three cities, Medellin, Cali, and Bogata. Each city gave me individual views. In Medellin, the native and Spanish facial features were similar. The mountains were beautiful. The driving was crazy! We saw fruit stands and some houses. At night we discovered how many houses we missed by the twinkling of lights on the hills. (Okay, I admit it — Medellin was my favorite city.) There were very few overweight people. In Cali, it seemed all the people were beautiful. Santiago said, “In Cali, they say the women have the most beautiful legs. But it is a lie. They just wear their dresses shorter.” Ha! Ha! It was true. It is hot and humid in Cali. Even young school girls wore their dresses shorter then we were used to seeing. Again, very few overweight people. When we reached Bogota, it was quite different. Like any city in the U.S., there we found more of a mixed group of people. We heard English, and faces were not so alike. The lifestyle was richer over all. And it showed in the body weight. I think it must be very difficult to be poor and overweight. My very favorite quote is from Santiago Fernandez. He would say: “You say ‘In America’ when you should say ‘U.S.A. or North America’, because we are all Americans, and I will correct you when you say this.” It makes me realize what a small world it is. South Americans are as proud to be Americans as North Americans are. I not sure how to explain this, but after a meal in the USA the restaurants are not allowed to give the leftover food to the homeless. Lawsuits and all that garbage. In Colombia after a meal Ochas asked to have the leftover chicken wrapped and took it out to a young girl selling flowers. I don’t see homeless in my town, but the thoughtful act deeply touched me. Many things touched me on this trip and I will never forget them. This entry was posted in Issue 8 (Mar/Apr), Reports and tagged colombia.